LSU defensive end Lewis Neal was recognized as the SEC Defensive Player of the Week for his stellar effort in the victory over Florida this past weekend. The junior defender out of North Carolina changed the complexion of the game with his energy and effectiveness off of the edge. He set single-game career highs for tackles (10), sacks (3.0), and tackles for loss (3.5). Neal now has 7.0 sacks on the season, which places him second in the conference behind Texas A&M defensive end Myles Garrett. Coach Miles praised the effort of Lewis Neal and then said: "If there’s a guy you want to model yourself as a team, you use Lewis Neal." 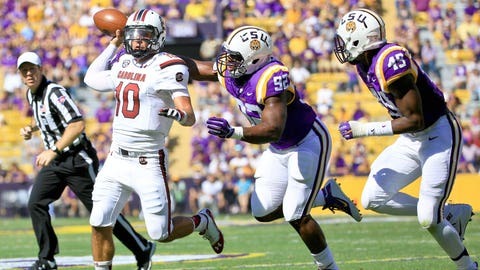 Neal’s emergence has been a big reason as to why LSU’s pass rush is improved. LSU ranks in the upper-half of the conference in sacks, after struggling to get after the passer in ’14. The Tigers had 19 sacks all of last year, and currently have accrued 17 with half of their schedule still remaining.